Given how competitors like Spotify and Apple now own the markets for streaming and purchasing music online, this move doesn’t come as a total surprise. What does come as a surprise, though, is that Microsoft has partnered with Spotify to move all its Groove Music Pass customers over to Spotify. Starting December 31, the Groove Music app will lose its features for streaming, purchasing and downloading music. Microsoft promises that moving to Spotify will be pretty seamless and that virtually all the songs and playlists that Groove users created over the years will transfer to the new service. Windows Insiders will be able to test this out with the next update, which is scheduled to roll out next week. Users will have until at least January 31, 2018 to make the move, though. For the most part, Spotify offers a superset of Groove’s music catalog, so except for a few edge cases, there’s no reason to believe that moving to Spotify would be a great loss for Groove Music Pass customers. And because Spotify is available on Windows Phone, too, even the few users still left on Microsoft’s failed mobile platform won’t miss out. As for Groove Music itself, Microsoft says the actual app won’t go away anytime soon. It’ll still be available for playing back and managing music that’s stored locally. Microsoft isn’t likely to come out and bluntly say that it has failed to capture any relevant market share in this space, but this move is about as clear an admission as any. 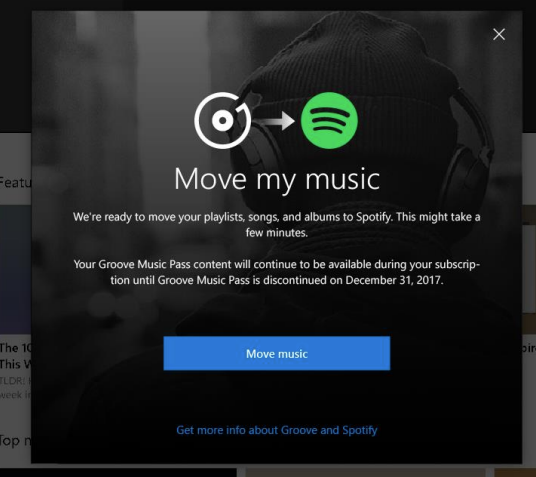 The $9.99 Groove Music Pass subscription never offered any features to set it apart from Spotify, iTunes and similar services. To be fair, it was a perfectly competent music streaming service, but there was nothing special about it. It’s worth noting that the Windows Store also offers games, video content and books. Here, too, Microsoft faces formidable competitors ranging from Steam (at least for PC gaming) to Netflix and Amazon. It doesn’t sound like we should expect similar “partnerships” in these areas, though, which makes sense, given that games and video content also play a major role in the Xbox ecosystem. As for books, though, I can’t imagine Microsoft is making a lot of money here or that offering an e-book store gives it much of an edge.